I've never seen Garfield this way - love it! I'm ROFLing! He's too cute! That look on his face and he's a pirate! Fabulous job! Love the project and Garfield! So cute -- love your Garfield!! Arrrgh! Garfield is so fun and fabo colors! So cute. Once again thank you for all you guys do. Happy Fright Night to you also. Love Garfield. Adorable project. Thank you for sharing. Have an awesome crafty day. He's my absolute favorite! Love the Garfield Halloween special. AWESOME! I have always loved Garfield, he such a cool kitty. aaarrrgghh Gimme all your candy!!! Loving pirate Garfield! Thanks for yet another awesome hop!!! Garfield is coolness! what fun, thanks for sharing! Angry pirate Garfield made me laugh. Love Garfield! Thank you for sharing! What an adorable Garfield. Love your colors, textures and shading. Oh my, LOVE Garfield. Such a cute project and a great hop. Garfield Halloween is one of my favorites too! I love Garfield! What a fun project! So fun! This was a great movie from my childhood too! Garfield has the best Halloween special! Thanks! Oh Garfield, you will always have a spot in my heart lol Great project!! Ha Ha I love it! It's my favorite!! Adorable! Who doesn't love Garfield! So cute. Thank you so much. Love it. I am a huge Garfield fan, have been for 30+ years now. Sadly I have never seen such a movie, but then we don't get much Garfield stuff here in Australia. garfield is a great choice! Great project. Garfield is awesome. Just when I thought it couldn't get any better with this hop, you make Garfield!! <3 Love him! Pirate Garfield is super duper darling. Such great projects! Love them all! Candace, Garfield is adorable. Thanks for sharing and thanks most especially for the hop! wasn't expecting Garfield either, very cute! Love it, well done on your project, thanks for sharing..
Love Garfield, he looks so fierce! Great project. So cute, I love your Garfield pirate! the best for last !! total classic ! Oh my gosh! Garfield Pirate is so cute! 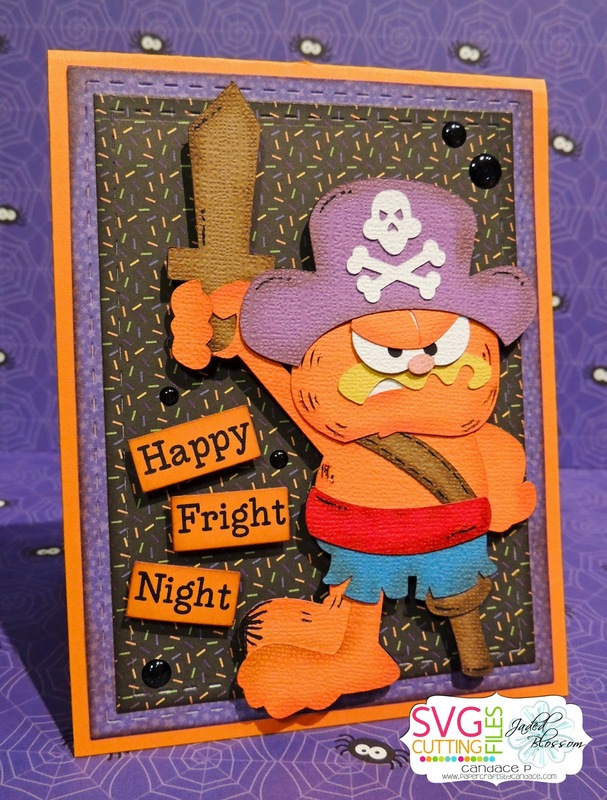 Love Garfield pirate, so cute! Oh my, love your Garfield!! Fun papers and adorable design! Such a fun hop! Your projects are all amazing! Love this HOP! Too Cute! Was a bit worried when I saw the freebies for RSVP that all cutting files would be for "scary" halloween stuff only - so glad to see some cute stuff here! Great Hop! OMG! Pirate Garfield! Awesome and so is your card. Thanks for sharing. OH great Garfield as a pirate! "Candy, candy, candy, candy, candy!" love this! I love all the projects in the Hop, but this one's my favorite! I love Garfield! How cute! Garfield is the best! Love it! Saved the best for last!!!! Oh my goodness this is so cute! We all love Garfield!! I didn't know Garfield had the energy yo make a movie. Oh, too cute! Love Garfield. LOL! That is a good one! Garfield is great. Yay for Garfield!! Great hop! Arrg! Looks just like Garfield!